An Airplanes and Rockets visitor wrote requesting that I post this article on the R/C Los Angeles airship, so here it is. There have been a few articles in the last year or so reporting on radio-controlled blimps (airships, dirigibles, etc.). The advent of super-light radio gear, powerful little brushless motors, and high energy density batteries has made them practical in almost any scale. This "Los Angeles" model is 53" long and 11½" in diameter, and will lift 8-10 ounces of gear. In 1968, when this article was published, there was no lightweight film covering material that was both strong enough and gas-tight enough to do the job, so thin silk and butyrate dope were used. Modern covering and equipment should let this baby fly to the moon! Patterned after a famous airship, this model can be made smaller or larger. 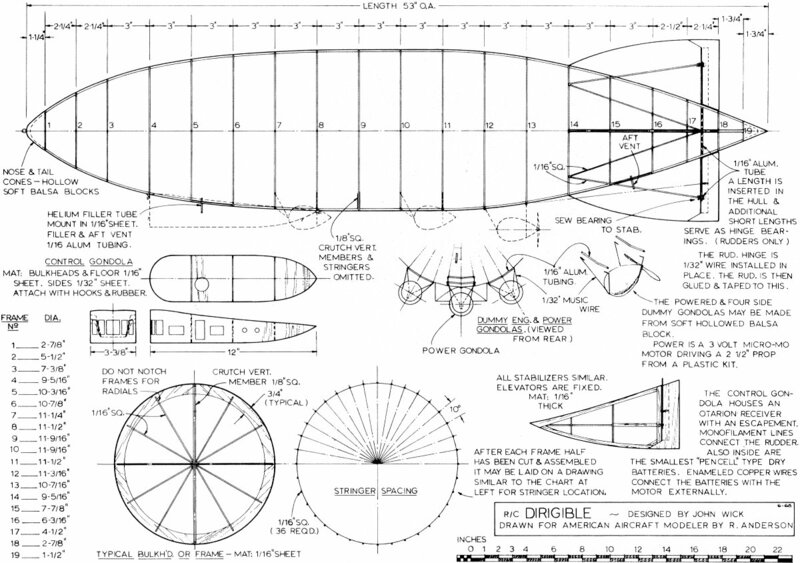 Use data given here to build your own dirigible. Perhaps a dirigible is your bag? Helium supports it, electric motor pushes it, and rudder-only by escapement steers it around. ON October 15, 1924, as a war repara­tion payment, the German Zeppelin Air­ship Works delivered to the United States the ZR-3, later re-christened the "Los Angeles." This 658-foot dirigible had just completed a 5000-mile flight from Friederickslafen to Lakehurst, N. J., and this was just the beginning. The ship logged a total of 4,320 hours in 331 flights, before being decommissioned at Lakehurst in 1932 and scrapped seven years later. Today, jet aircraft are so commonplace that most people won't spare an upward glance. On the other hand, it would be most interesting to observe public reaction to a silver cigar-shaped object almost three city blocks long, flying, or should I say sailing, overhead. It is indeed sad to note the passing into another time of the giant airships, but the long record of tragedies associated with their existence, doomed them to extinction. The final curtain of dirigible development fell when the Hindenburg unexplainably burst into flames and was completely destroyed with a loss of 36 lives while attempting a mooring at Lakehurst in 1937. Lattice-work of stringers makes it a true airship. Structure is quite similar to the real Los Angeles. Light and durable. Regarding the model, I had always kept the thought of constructing a working model of a dirigible in my model building itinerary. Finally construction began with the success or failure reported herein. It seemed logical to me that if an aluminum structure was used on the original airship, a careful substitution of balsa would be both strong and light enough to maintain a lighter-than-air condition. The ship is built on a 1/8" sq. crutch in the half-shell fashion. The most difficult part of the construction is in the aligning of the first four stringers. Once these are glued in, the structure will take on a little strength. After gluing in half of the bulk­heads, and while still on the board, add three temporary 1/16" sq. braces between each of the bulkheads. After adding bulkheads to the other side and installing these temporary braces, the structure may be suspended from the rafter and the stringers may be installed, to each side. The struc­ture will be strong enough to work on normally. Many less experienced modelers have added stringers to a half-shell while still on the board, resulting in a bowed framework. This would be most noticeable on the dirigible because of the larger than usual size of the ship as compared to the smaller than usual size of material used in the construction. The gondola is constructed on the ship before it is covered with silk to insure a good fit. Two pipes of 1/116" aluminum are epoxied in; one is a filler, the other a vent. The main fill tube is located in the gondola, which is made oversize to contain an Otarion receiver and escapement. The small electric motor in the rear pod drives a pusher propeller which just barely moves the craft. The initial filling of the ship with helium resulted in a collision with a sharp rafter projection, and down it came. After patching and refilling, a successful flight was made across the living room. In about five minutes the ship slowly settled to the floor. It was clearly evident that the dope covered silk would not hold helium. After some heavy concentration, we thought perhaps two coats of hot-fuel proofer might work. This application rendered the envelope leak-proof and many short flights were made. By the addition of varying amounts of clay ballast, neutral trim could be maintained and with the power on a slight climb was evident. The original model is 56" long and weighs in at 11 ounces. It will lift approximately eight to ten ounces of radio gear, depending on the existing barometric pressure. 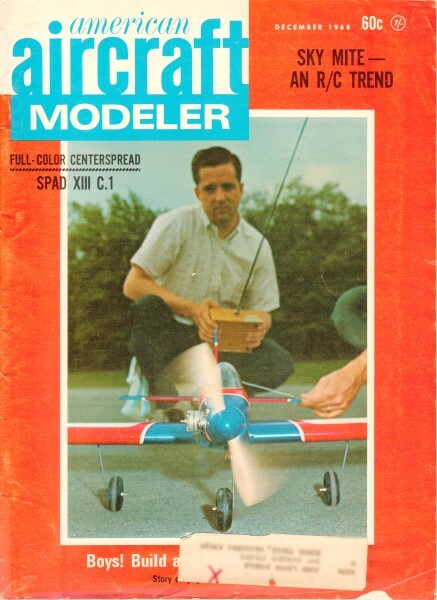 A larger craft of six to seven feet length is planned for the future, utilizing three-channel R/C gear. These model airships are designed for in door flying exclusively because, like their big brothers, they would be subject to the slightest breeze and, if one did over­fill or hook a thermal, it would probably result in the longest model chase in history. One indoor flyer suggested that it would make an excellent indoor model retriever. With more experimentation on the project, he may be quite correct. Dirigible specs: Overall length is 53"; maximum diameter 11-1/2". Airframe weighed 13 oz. less the R/C gear. Entire hull is sealed in order to allow maximum room for helium. Covering is silk with six coats of dope and fuel-proofer to seal against loss of helium (this gas will leak rubber membrane). Framework is built upon a 1/8" sq. crutch formed of the backbone and a keel. Each bulkhead is one-half of a circle and of 1/16" sheet balsa. Crosspieces under each bulkhead are also 1/8" sq. Cross-braces radiating from the center of the ship and outward to the bulkheads are 1/16" sq. Bulkheads are not notched for them. On each half 25, 1/16" sq. stringers were used about eight degrees apart - could probably change this to 10 degrees apart to simplify matters. After erection of the bulkheads on the crutch, remaining halves of each bulkhead were cemented in place. Lastly, the stringers were added, this being done off the workbench and in the hands, so to speak. Two 1/16"-dia. aluminum tubes are used for the fill and vent. Both fill and vent should be on bottom of dirigible - the top; rear location for the vent is wrong. Vent must be on bottom so heavier air can escape and be displaced by the lighter helium. The cabin is a very light framework fitted to the body first, but not cemented on until the body has been covered. It had windows in it but they were left without plastic covering. Escapement was connected to rudder with monofilament lines (externally). A three-volt Micro-Mo motor was the power driving a 2½"-dia. plastic prop from a plastic model kit. Battery power was taken from the very smallest of pen-cell-type dry batteries. Batteries are connected to motor with small, enameled copper wires (externally). Motor is mounted in small, hollowed-out balsa pod. Other dummy motors-not shown in pencil drawings - were made the same way. Tail surfaces all of 1/16" sheet, hinging of 1/32" wire and 1/16" aluminum tube. Tube must go through fuselage vertically to eliminate leakage. Short alternating sections of tubing may be silked to 1/16" sheet. Fin braces radiate (there are eight of them) from four equidistant points around the fuselage. You can label these points "X." They branch out and go to opposite side of each fin at points "Y". No C.G. position. Just add clay until dirigible balances in a slightly nose-down condition (under power the nose will come and a shallow climb results). Addition of clay also allows the modeler to regulate the amount of lift useable. You don't want too much. Helium is retained for about 20-30 minutes. Payload is about 8-10 oz. depending upon atmospheric pressure.